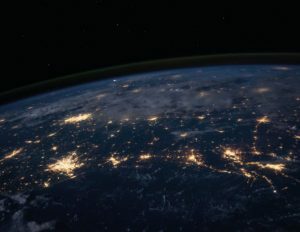 With World Space Week taking place on 4th – 10th October, could you hold a themed night which is ‘out of this world’? Purchase some special space themed scratch art shapes from a craft supplier and let the children use their imagination to create works of art. You can purchase scratch art online from bakerross.co.uk (approx. £4 for 12). 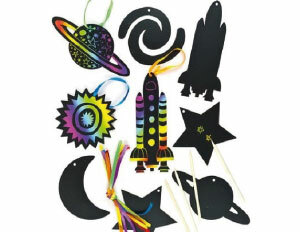 You can also find a range of other ready to go ‘space’ themed craft activities. Print out small pictures of different space related items – Planets, stars, comets, rockets etc – and hide them around your hall. You will need a complete set for each team you have playing the game. Split your young people into teams and give them each a list of space items they need to find & collect. The first team to collect all the items on their list are the winners. 1. Take a piece of paper and placing hand flat onto paint (or use sponge/brush to apply paint on to hand), imprint on to piece of paper. 2. Wash and dry hand, before repeating. Encourage each child to do a few prints with different colours. 3. Now using paint brushes, colouring pens and other craft supplies, let the children decorate their hand print to turn them into alien faces. Get the children into a line at one end of your meeting space and have leaders with sponge/light plastic balls lined up against the sides of the room. On the whistle, children need to run up and down the room dodging the comets (balls) which are being thrown across the meeting space. Anyone who gets hit by a comet is ‘lost in space’ and must sit out. The winner is the last person standing. The Universe and everything in it is amazing. Get the children thinking about space and then relate it back to the story of creation. Start off by telling them that there are more stars in the universe than grains of sand on all the beaches on Earth. That’s at least a billion trillion! How amazing is that? The bible tells us that God spent time creating everything that is around us, from all those stars in the sky to all the grains of sand on our beaches. After creating all of that, he then took the time to create you and me. Explore the story of creation with your group. Find out what the children know about Astronauts and help them to learn something about what it means to be an astronaut and go into space. Tim Peake is a British astronaut who became famous when he spent six months living and working on the International Space Station (ISS) in 2015/16. He was the first British astronaut to board the ISS, a laboratory 400 kilometres from Earth.